Obesity may negatively affect survival in breast cancer (BC), but studies are conflicting, and associations may vary by tumor subtypes and race/ethnicity groups. In a retrospective review, we identified 273 women with invasive BC administered Adriamycin/Taxane-based neoadjuvant chemotherapy from 2004 to 2016 with body mass index (BMI) data at diagnosis. Obesity was defined as BMI ≥30. 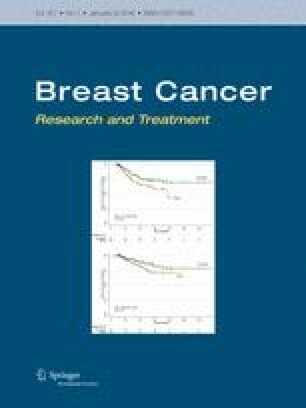 Associations between obesity and event-free survival (EFS), using STEEP events, and overall survival (OS), using all-cause mortality, were assessed overall and stratified by tumor subtype [[Hormone Receptor Positive (HR+)/HER2−, HER2+, and Triple-Negative Breast Cancer (TNBC])] in our diverse population. Median follow-up was 32.6 months (range 5.7–137.8 months). Overall, obesity was associated with worse EFS (HR 1.71, 95% CI 1.03–2.84, p = 0.04) and a trend towards worse OS (p = 0.13). In HR+/HER2− disease (n = 135), there was an interaction between obesity and hormonal therapy with respect to OS but not EFS. In those receiving tamoxifen (n = 33), obesity was associated with worse OS (HR 9.27, 95% CI 0.96–89.3, p = 0.05). In those receiving an aromatase inhibitor (n = 89), there was no association between obesity and OS. In TNBC (n = 44), obesity was associated with worse EFS (HR 2.62, 95% CI 1.03–6.66, p = 0.04) and a trend towards worse OS (p = 0.06). In HER2+ disease (n = 94), obesity was associated with a trend towards worse EFS (HR 3.37, 95% CI 0.97–11.72, p = 0.06) but not OS. Race/ethnicity was not associated with survival in any subtype, and there were no interactions with obesity on survival. Obesity may negatively impact survival, with differences among tumor subtypes. The online version of this article (doi: 10.1007/s10549-017-4507-y) contains supplementary material, which is available to authorized users. This study was funded by the National Center for Advancing Translational Sciences, National Institutes of Health, through Grant Number KL2 TR000081. Author EC has received funding from Merck and has served as a consultant for Eisai. Author KK has served as a consultant for Lilly, Biotheranostics, Amgen, Eisai, and Novartis. All other authors have no conflicts of interest to declare.